Al-Anon Family Groups provides a safe, caring environment where members can learn to regain some peace of mind, emotional health and happiness, whether the alcoholic is still drinking or not. Al-Anon helps those affected by someone else’s obsessive drinking to realise that it is possible to improve the quality of their own lives. Listening to the experience of others, benefitting from the shared wisdom of the Al-Anon programme and learning about the family disease of alcoholism from those who have lived through it, can turn despair into hope. Revd. 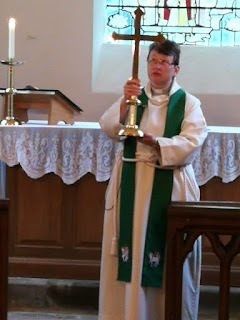 Canon Beverley dedicating the new altar cross in memory of Revd. Martin Young and the new childrens' corner in Quinton church on the 14th of October 2018.